The U.S. dairy industry is pleased the Trump administration has reached a new trilateral trade agreement with Canada and Mexico that should lift a cloud of uncertainty adversely affecting U.S. dairy farmers and exporters. • The new U.S.-Mexico-Canada Agreement (USMCA) modernizes the existing North American Free Trade Agreement (NAFTA). • We want to thank President Trump and his administration for fighting for the trade interests of the U.S. dairy industry and the nearly 3 million jobs it supports. • The conclusion of this agreement resolves concerns about the evaporation of NAFTA, which has been essential to our success in Mexico – now our #1 export market valued at $1.3 billion last year. • The dairy sector is still carefully analyzing the details and their potential impact, including the removal of Canada’s Class 7 milk pricing scheme and newly negotiated levels of market access to Canada. Congress is in the midst of the same process as it considers future Congressional action on this agreement. • A lot of hard work went into finalizing the agreement, but important work still remains. We will not see the benefits of USMCA until the administration rolls back metal tariffs on Mexico and Mexico ends its retaliatory tariffs on U.S. cheese exports. • Retaliatory tariffs by Mexico and China have already cost U.S. dairy farmers an estimated $1.5 billion this year with 2019 losses forecasted to exceed more than $3 billion, according to a recent Informa Agribusiness study. • Agreement on USMCA also frees up the Trump administration to devote more time to repairing U.S. trade relations with China, which has levied retaliatory tariffs on U.S. dairy exports, valued at $577 million last year, and to pursue bilateral negotiations in earnest with high-potential markets like Japan and, post-Brexit, the UK. o Market Access: The deal provides slightly more market access than what Canada committed to provide in TPP, however in this case the U.S. is the sole beneficiary of those opportunities. o Canada’s Class 7: Eliminates Class 7 six months after implementation & establishes new pricing structures for SMP, MPC & infant formula. Establishes annual export limits on Canadian exports of SMP & MPC and of infant formula, above which export surcharges are levied with the goal of constraining Canada’s ability to dump unlimited quantities of dairy products onto global markets. o Geographical Indications: Includes new disciplines to strengthen the ability of common name users to oppose GI applications that would monopolize use of generic terms. Establishes a non-exhaustive list of commonly used cheese names that may not be restricted by Mexico moving forward. o Sanitary & Phytosanitary Provisions: Establishes rules that will provide for more transparency and more scientific grounding of countries’ regulations in ways that should help prevent non-tariff barriers to trade. Midwest Dairy and Nebraska Dairy Extension are again partnering to offer a Dairy Ambassador program in 2019. 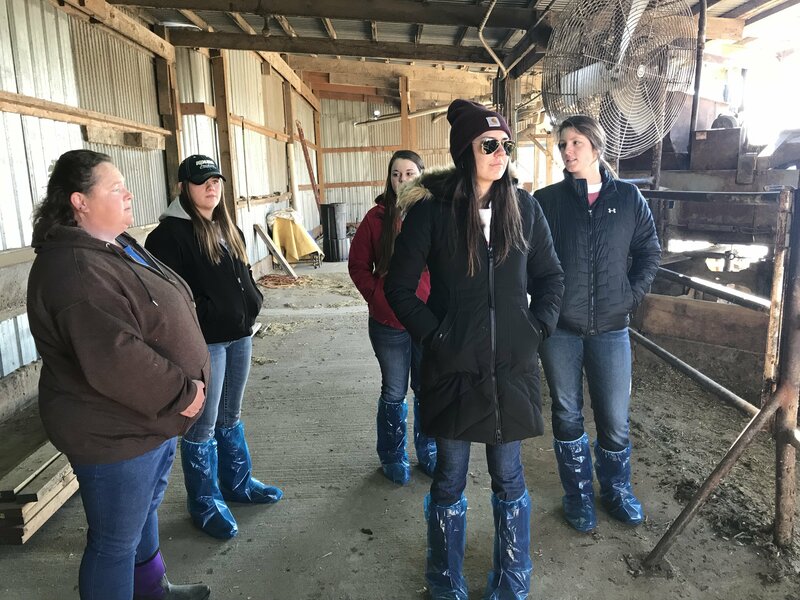 This program is a year-long leadership program where students have the opportunity to learn about the dairy community and share their love for dairy with students, future leaders and consumers while learning and advancing their leadership skills. Ambassadors will participate in a number of events throughout the year such as Ag Literacy Festivals, Moo at the Zoo, the Nebraska State Fair, dairy farm tours, agribusiness tours and other leadership programs. At the end of the program, Ambassadors will receive a $1,000 scholarship from Midwest Dairy. In addition to the scholarship, Ambassadors will receive a $75 per diem for each day they participate in events. Applicant eligibility includes 1) Applicant must be enrolled full-time in a Nebraska post-secondary school for the duration of the appointment. 2) Applicant must provide their own transportation. Reimbursement for travel expenses (mileage and hotel) will be provided for all approved events. 3) Applicant must communicate effectively through email, text messaging and in-person. 4) Applicant must have a passion for dairy. Applications are to be completed online at this link: https://www.midwestdairy.com/for-farmers/ambassadors/. Applications are due December 1 and notices sent by January 1, 2019. Did you know Nebraska Dairy Extension has a number of online publications for a number of topics you can use on your farm? Below are just a few of the online publications with links to the publications we offer. Additional resources can be found on our website: Dairy.unl.edu. If there is a resource you would like and cannot find, please contact Kim Clark at kimclark@unl.edu or 402-472-6065. 2019 NSDA Annual Convention is scheduled for February 26, 2019 in Columbus at the Ramada Hotel and Conference Center. Mark your calendars!